A must read: “Lackner and Jospe, Climate Change is a Waste Management Problem, Issues in Science and Technology, June 2017.” Times have changed. Delay has created a new climate that requires new strategies. The following is a summary of this must read article. — Carbon dioxide is a waste product; dumping it into the open air is a form of pollution. — Current climate pollution reform culture says we must stop polluting. — For the last 30 years, it seemed possible that limiting and then stopping climate pollution would work. — Now we realize that delay has created a climate where complete elimination of climate pollution emissions allows continued warming. 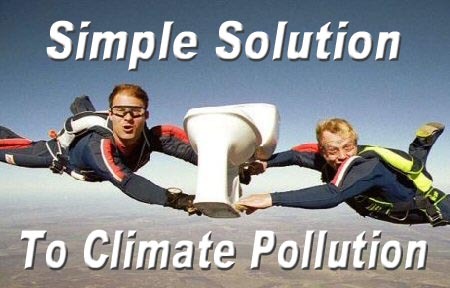 — When we realized that human sewage pollution was killing millions, we did not limit sewage emissions, we treated the pollution. — Today we are fortunate because we can both limit climate pollution and treat it like human sewage. — The technologies exist and they are little different in costs or expense from treating human sewage. — Storage opportunities are widespread and abundantly adequate to meet the need. — The earliest of these technologies was first used to keep our sailors safe from carbon dioxide poisoning in submarines in WW II. — Emissions reductions are still important but the critical path today, because of the great delay in action, says we must reduce and treat at the same time. On the Photo: Our apologies to the creator of this fantastic flying toilet photo. We looked, but could not find an attribution. Thanks!